The new issue of the “ISTORIYA” which we are presenting to the readers was prepared by the Center for Nordic and Baltic History and is devoted to the problems of the Scandinavian-Baltic region’s history, including issues of international relations and those of political and cultural links. The articles cover a long chronological period — from the Viking Age to the present. Articles included in the issue by the editorial board are arranged chronologically, and by topics they can be divided into three sections — the Scandinavian one, the Baltic one, and the historiography one. One of the most important groups among foreign sources on the history of Old Rus is represented by those from Scandinavia. They contain information on military campaigns, political and matrimonial links between Old Rus and Scandinavia, and trade relations as well. Tatjana N. Jackson (Institute of World History, Russian Academy of Sciences) studies Old Norse sagas as a source on the relationship between Scandinavia and Old Rus, and, particularly, the periods when four Norwegian konungs (kings) stayed in Rus — Olav Tryggvason in 977—986, Olav Haraldsson in 1029, Magnus Olavsson from 1029 to 1035, and Harald Sigurdsson in the early 1030s and early 1040s. Elena A. Melnikova (Institute of World History) also uses Old Norse sources as a basis for her study of a trade treaty between Novgorod and Norway supposedly concluded in the period of 1024—1028. Russian-Norwegian relations in Modern Times are analyzed in the articles by Ludmila A. Sadova (Institute of World History), and by Vladimir A. Karelin (Murmansk Economics Institute) and Kari Aga Myklebost (University of Tromsø — The Arctic University of Norway). In her article Ludmila Sadova focuses on estimates of the origins and development of Swedish-Norwegian Union’s crisis by Russian diplomats in Norway in 1890s. Vladimir Karelin and Kari Aga Myklebost analyze the Norwegian scholar Olaf Broch’s activities aimed at a rapprochement between Russia and Norway, his contacts with Russian scientists, politicians and public figures. Evgeniya V. Korunova (Moscow State University) assesses international relations in the Scandinavian region on the eve and during World War II, paying attention both to Scandinavian countries’ efforts to preserve their neutrality and independence in case of a conflict and their plans to create a Scandinavian defensive alliance. Articles on Baltic topics included in the issue deal with political and cultural links between Russia and Latvia. 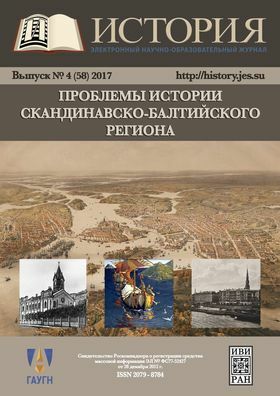 Vitalii Shalda (Daugavpils University) studies the emergence of Latvian national organizations and the history of Latvians in Russia, taking the Christ the Savior Chirch in St. Petersburg as an example. Efforts of Latvian intellectuals in Russia to help refugees during World War I are described by Evgeniya L. Nazarova (Institute of World History). The article by Dmitrii V. Avetyan (State Academic University for the Humanities) shows how Soviet authorities formed the image of the Latvian community in the USSR and covered Moscow’s relations with Latvia in mass media. Yulia L. Mikhailova (Institute of World History) publishes documents on the history of Soviet cultural diplomacy in Latvia in 1926—1933. She introduces into academic discourse documents from the Russian Federation Foreign Policy Archive covering the creation (in 1929) and activities of the Latvian Society for the Cultural Rapprochement with the Peoples of the USSR and the involvement of Soviet diplomacy in this process. The issue also includes articles dealing with Russian historiography of the Scandinavian-Baltic region. Olga V. Tschernysheva (Institute of World History) reviews the emergence and development of Russian Scandinavistica starting from the middle of the last century. She describes the main significant stages of this research area development, and, in particular, the history of Scandinavian conferences which were organized regularly since 1963 and served as a platform for presenting the results of relevant research and elaborating new approaches to the studies of the Nordic countries’ history. The article is especially interesting because of the fact that its author, being one of the founders of Russian Scandinavistica, was a witness and participant of the events she is writing about. Alexey A. Komarov (Institute of World History) concentrates on the current state of Scandinavian studies in Russia — his article can be regarded as a continuation of Professor Tschernysheva’s review. The results of Nordic studies in Russian regions are presented in the article by Sergey G. Verigin, Irina R. Takala and Ilya M. Solomeshch (Petrozavodsk State University) on the history of Nordistica in Karelia, and that by Andrey V. Repnevskii (Northern (Arctic) Federal University), who assesses the history of Russian and Norwegian cooperation in the studies of Russian-Norwegian relations in 1991—2015. Yulia L. Mikhailova (Institute of World History) analyzes the development of Baltic studies in her institution and the process of academic contacts’ establishment between the Institute of World History RAS and historians from the Baltic states starting from the dissolution of the Soviet Union and up to the present day. It is worth noting that some of the articles in this issue of the Electronic Scientific and Educational Journal are published in English. All English-language pieces are based on the authors’ presentations at the international conference «Historical Background and Future Prospects in Russian-Nordic Relations» that took place in Moscow on June 23, 2016. The conference was organized by the Institute of World History (Russian Academy of Sciences) on the initiative of the Institute’s Academic Supervisor Academician Alexander O. Chubaryan in collaboration with the Voksenåsen Center for Swedish-Norwegian cooperation. This event was part of a conference series under the umbrella title “Russia and the Nordic Countries. The Past, Present and Future” [ENG, NOR] which were held regularly starting from the fall of 2015. These conferences, which served as a platform to discuss problems of interaction between Russia and the Nordic countries, were aimed at elevating the level of mutual understanding between the countries and peoples of this region. They were organized by: the Hanaholmen Swedish-Finnish Cultural Centre (Helsinki), the Voksenåsen Center for Swedish-Norwegian cooperation (Oslo), the Fund for Danish-Norwegian Cooperation (Lysebu-Oslo, Schæffergården-Copenhagen), the Biskops Arnö Nordic Folk High School (Sweden), and the Nordic House (Reykjavik). Below you will find the names of authors whose articles published in this issue of the Journal are based on presentations at the conference «Historical Background and Future Prospects in Russian-Nordic Relations» (Moscow, June 23, 2016). These authors are: Tatjana Jackson, Elena Melnikova, Sergey Verigin, Irina Takala, Ilya Solomeshch, Alexey Komarov, Andrey Repnevskii. Was There a Russian-Norwegian Trade Treaty Concluded in 1024—1028?